This volume contains the ten most cited articles that have appeared in the journal Atmosphere-Ocean since 1995. These articles cover a wide range of topics in meteorology, climatology and oceanography. Modelling work is represented in five papers, covering global climate model development; a cumulus parameterization scheme for global climate models; development of a regional forecast modelling system and parameterization of peatland hydraulic processes for climate models. Data rehabilitation and compilation in order to support trend analysis work on comprehensive precipitation and temperature data sets is presented in four papers. Field studies are represented by a paper on the circumpolar lead system. While the modelling studies are global in their application and applicability, the data analysis and field study papers cover environments that are specifically, but not uniquely, Canadian. 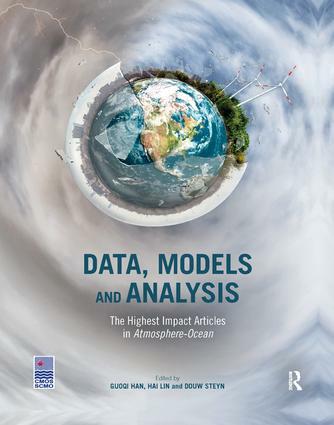 This book will be of interest to researchers, students and professionals in the various sub-fields of meteorology, oceanography and climate science. Guoqi Han is a Research Scientist at Fisheries and Oceans Canada, and an Adjunct Professor at Memorial University, Canada. His main research field is physical oceanography, including coastal ocean modelling, satellite oceanography, as well as ocean climate variability and change. He publishes regularly in peer-reviewed scientific journals. He serves as an Editor-in-Chief of Atmosphere-Ocean, an Academic Editor of PLOS One, and an editorial member of Ocean Modelling. He is the Lead Scientist for ocean sciences in the Surface Water and Ocean Topography – Canada (SWOT-C) Program. He is a Vice Chair, Commission A: Space Studies of Earth’s Surface, Meteorology and Climate, Committee on Space Research. He was awarded the Prize in Applied Oceanography by the Canadian Meteorological and Oceanographic Society in 1998. Hai Lin is a Research Scientist at Environment and Climate Change Canada (ECCC), in the Meteorological Research Division. He is also an Adjunct Professor at the Department of Atmospheric and Oceanic Sciences of McGill University, Canada. His research interests include large-scale atmospheric dynamics, climate variability and numerical weather prediction. He leads the research and development of sub-seasonal and seasonal prediction systems in Recherche en Prévision Numérique of ECCC. He was the recipient of the 2010 President’s Prize of the Canadian Meteorological and Oceanographic Society. He publishes regularly in international journals, served as an Associate Editor of Monthly Weather Review and is an Editor-in-Chief of Atmosphere-Ocean. He is a member of the Steering Group for Subseasonal to Seasonal Prediction of the World Weather Research Programme and World Climate Research Programme of the World Meteorological Organization. Douw Steyn is a Professor Emeritus of Atmospheric Science at The University of British Columbia, Canada, in the Department of Earth Ocean and Atmospheric Sciences. His professional, teaching and research activities are in the field of air pollution meteorology, boundary layer meteorology, mesoscale meteorology, environmental science and interdisciplinary science. His research involves measurement and modelling studies of regional air pollution, especially in regions with complex terrain. He publishes regularly in international peer reviewed literature, has served as Editor of Atmosphere-Ocean and on the editorial board of Boundary Layer Meteorology. He is an Accredited Consulting Meteorologist and has international consultancy experience in his areas of expertise. He has been awarded the Mentorship Medal of the Canadian Federation of Earth Sciences and the Andrew Thompson Prize in Applied Meteorology by CMOS, and is a Fellow of CMOS.